Earth, and Death upon the Cross for lost Mankind. Newcastle upon Tyne: Printed in this present Year. Remember Christ and his blessd Birth. There was our blessd Messias born. But a poor hungry Oxs Stall. Mans sweet Salvation for to be. The Princely Babe, JESUS born. To learn to bear in humble Mind. And unto CHRIST, our Saviour. He unto us a Son hath given. Could ransom thee from cruel Death. And loose his Life in your Defence. Himself much Pain did undergo. He daily spent away the Time. And made the Lame to walk upright. And to Sick their Health he gave. That with a kiss betrayd him then. Should suffer death upon a Tree. They crownd him with a wreath of thorns. This appears to be the most recent Broadside that has been discovered, published up to 100 years after the earliest ballad (Roxburghe 1.374, 1634). The spelling is much closer to modern standards. It has a relatively large number of changes, although few by way of comparison to other carols that have been amended by assorted printers and editors. This version has 28 verses. 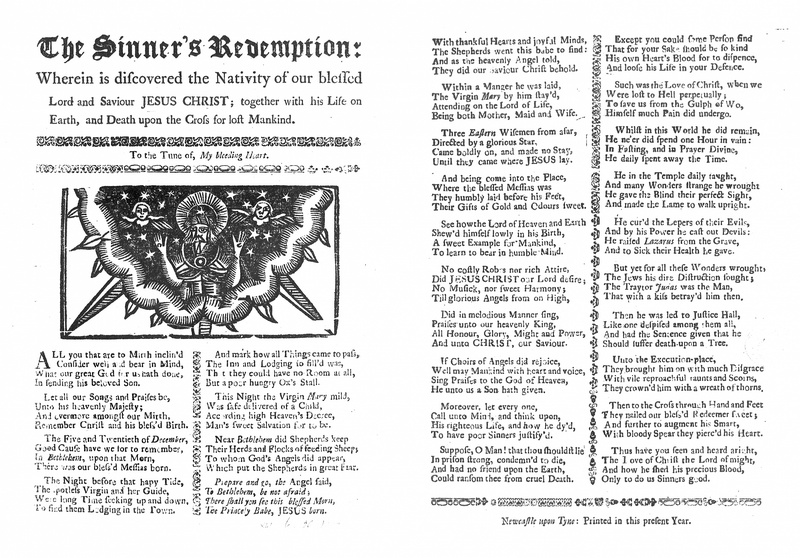 Another carol on this site was printed as a Broadside by a printer located at Newcastle upon Tyne. His name was John White, and between 1725 and 1769, he published a Broadside, You Mortals All Of High and Low Degree, also published with the title "Christ's Love to Penitent Sinners." This ballad was preserved in the Roxburghe collection, Roxburghe 3.784-785 (English Broadside Ballad Archive, EBBA ID 31487). It is worth noting that this carol was published between 1730 and 1769, roughly the same time frame as "You Mortals All," and that this carol was also preserved in the Roxburghe collection, Roxburghe 3.288-289.